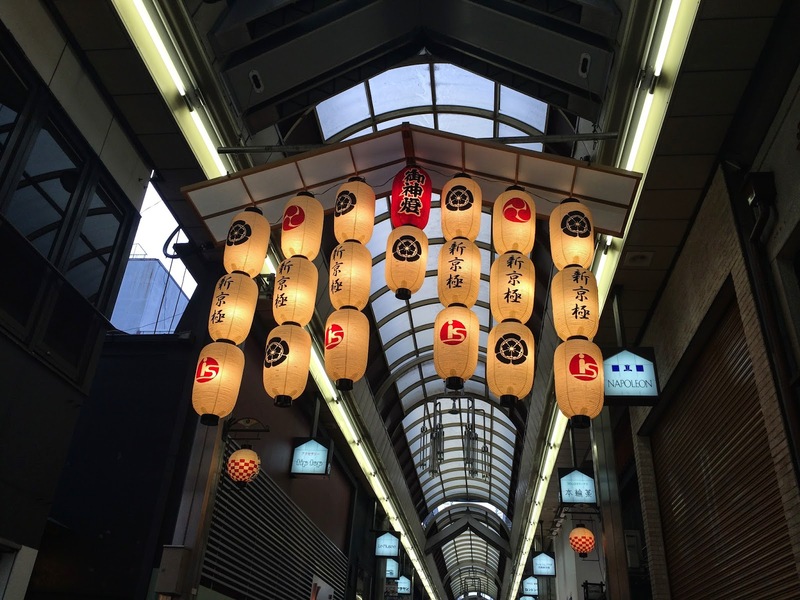 Today is another day in Kyoto. I woke up with a really bad sore throat and fever in the morning though from being outside all day the previous day (we walked 20km outside in the 32C heat). Sorry if I didn't vlog enough or take enough photos. 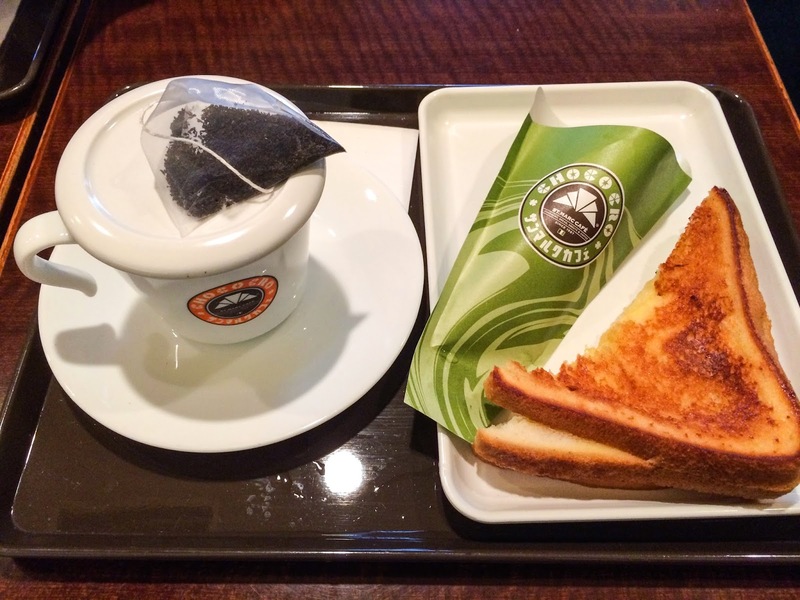 We had St. Marc Cafe again for breakfast! 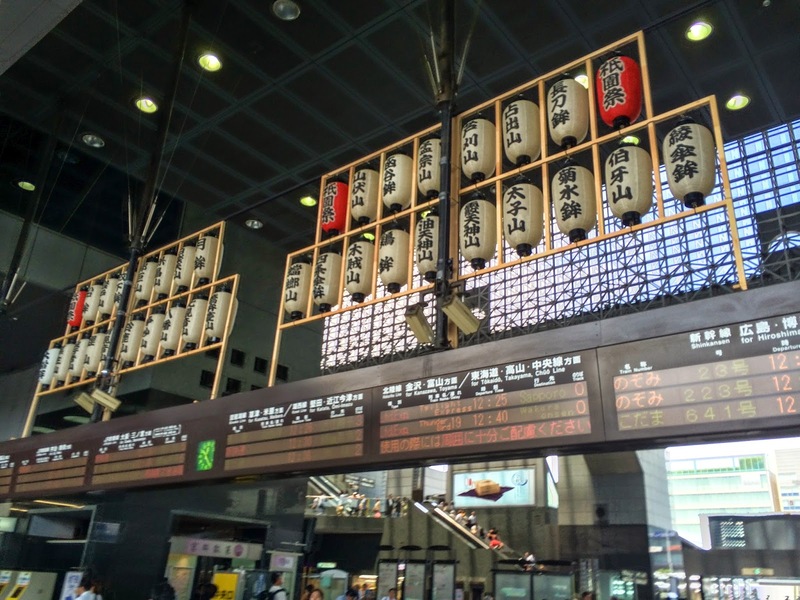 We took the normal express train from Umeda to Kyoto, which took around 40 minutes. It was express for the first 3 stops and turned into a local train later on. 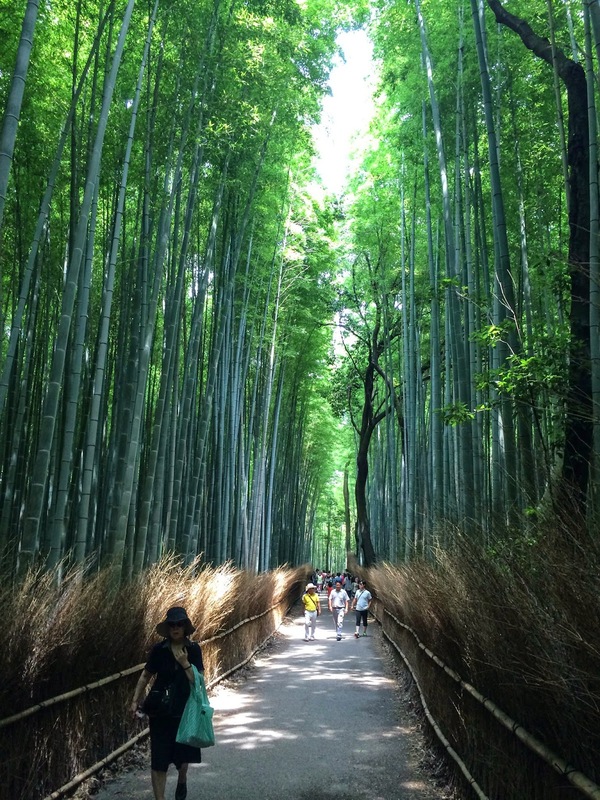 After we got to Kyoto, we took the JR to Saga-Arashiyama 嵯峨嵐山 station to see the famous Bamboo Forest near Arashi Mountain. 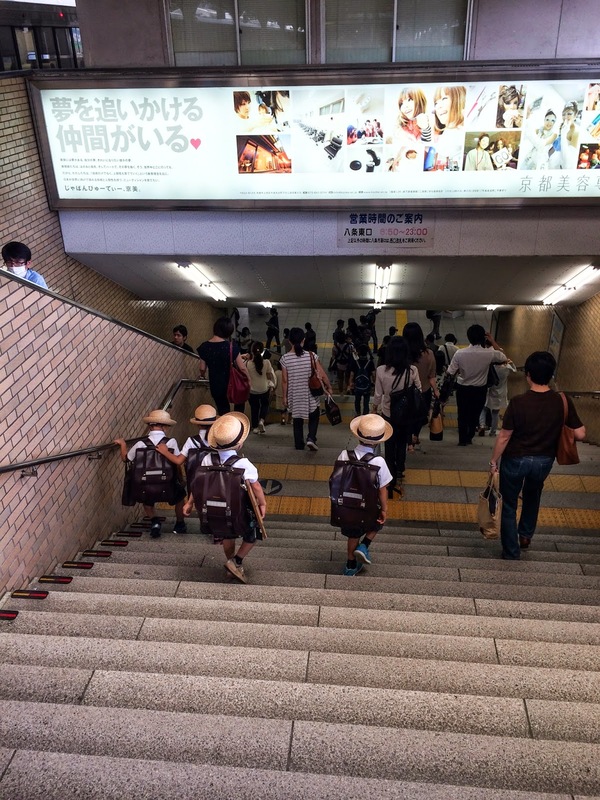 Some cute elementary school kids at Kyoto Station. Their uniform is adorable! 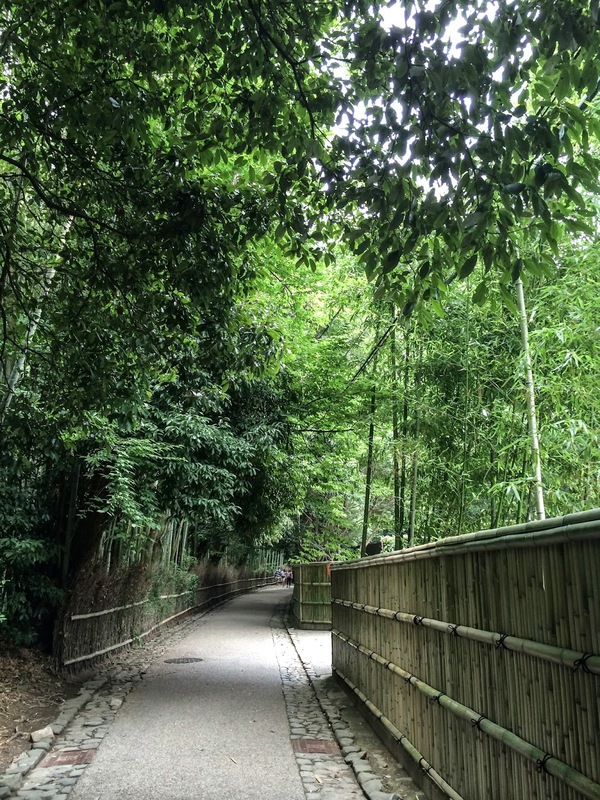 The walk from the station to the actual Bamboo forest was around 15 minutes, but immediately after entering the forest, it felt like the temperature dropped 5 degrees and was really breezy. There are carriages pulled by people you can sit on instead of walking. The only down side is the mosquitoes in the shades are vicious! I came out with 3 huge bites. 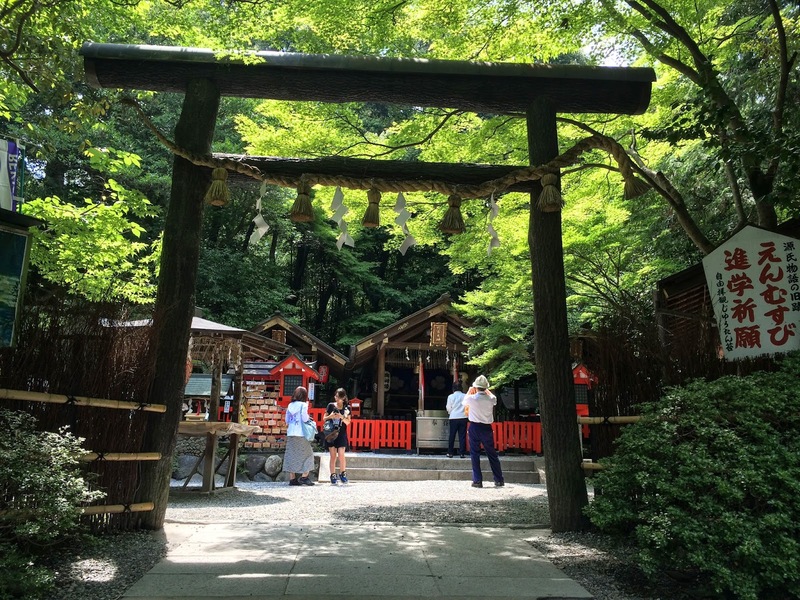 There’s also 1 shrine, Nonomiya Shrine 野宮神社, and 1 temple inside the bamboo forest. 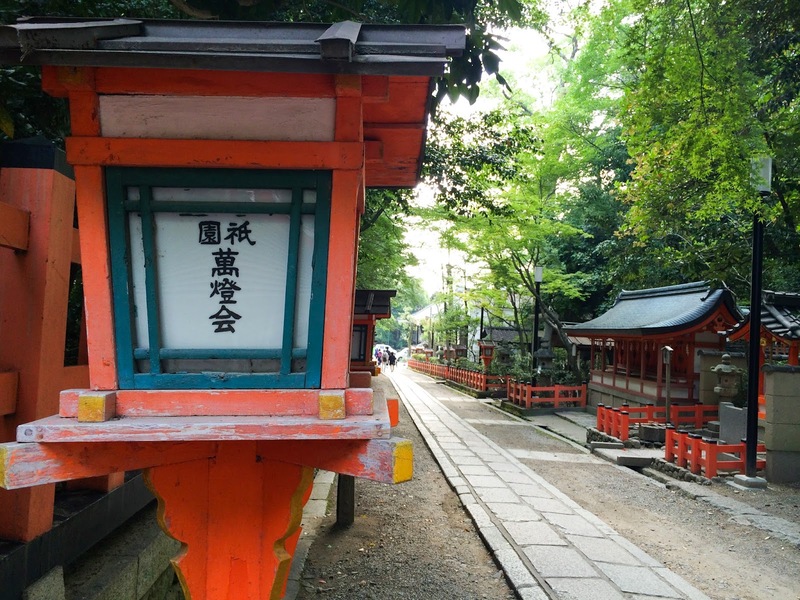 Nonomiya Shrine - on the right side it says that this place is good for those who want to pray for getting into good schools/getting good grades, or having better luck in relationships. But it also has a small section inside for those who want to pray for safe baby delivery. 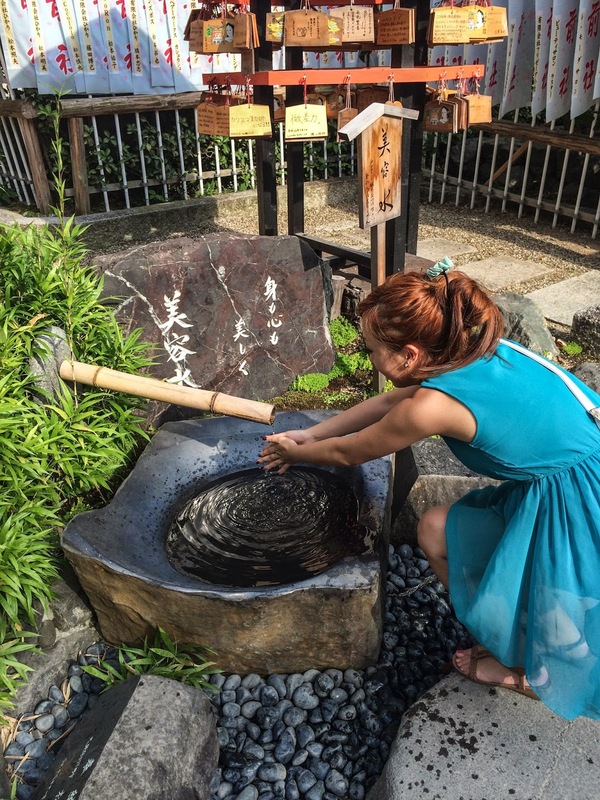 This is a common thing that Japanese pray for, both pregnant women and men that have a partner expecting a baby pray for this. 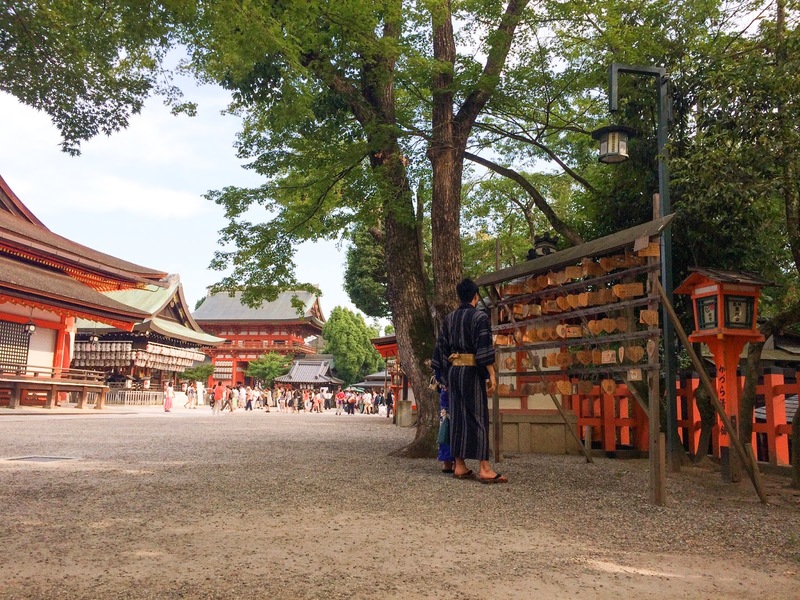 Next we went to Yasaka Shrine八坂神社, the main shrine in the Kyoto area. 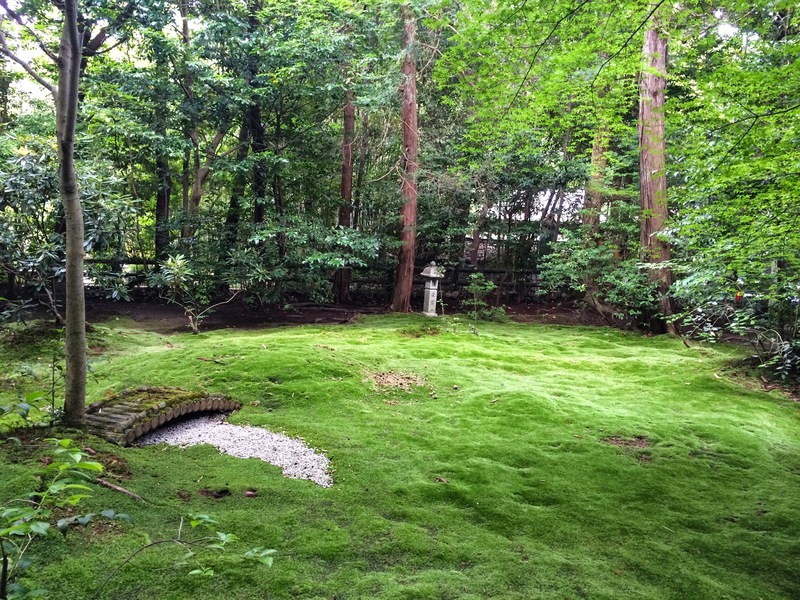 It’s near Gion 祇園, accessible with #100 bus from Kyoto station. 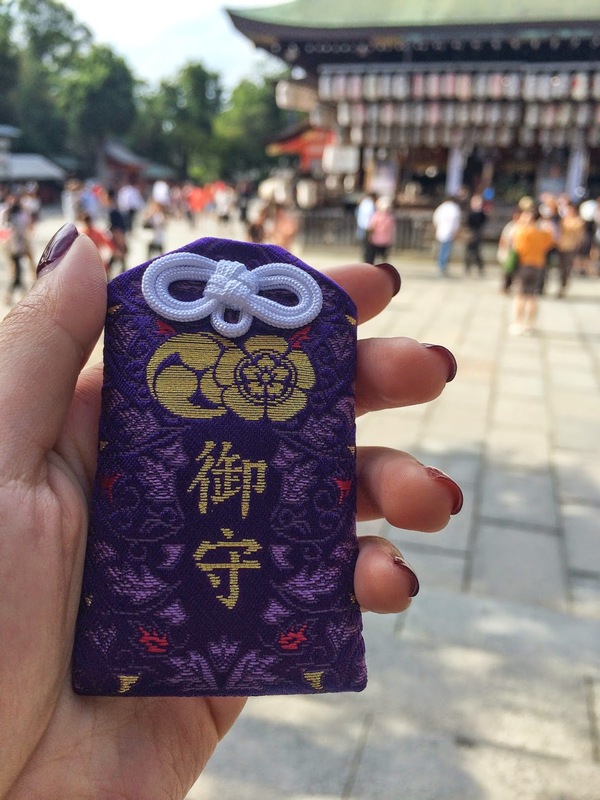 I got a health Omamori お守り since I was feeling sick. But I did manage to draw a good O-mikuji おみくじ. 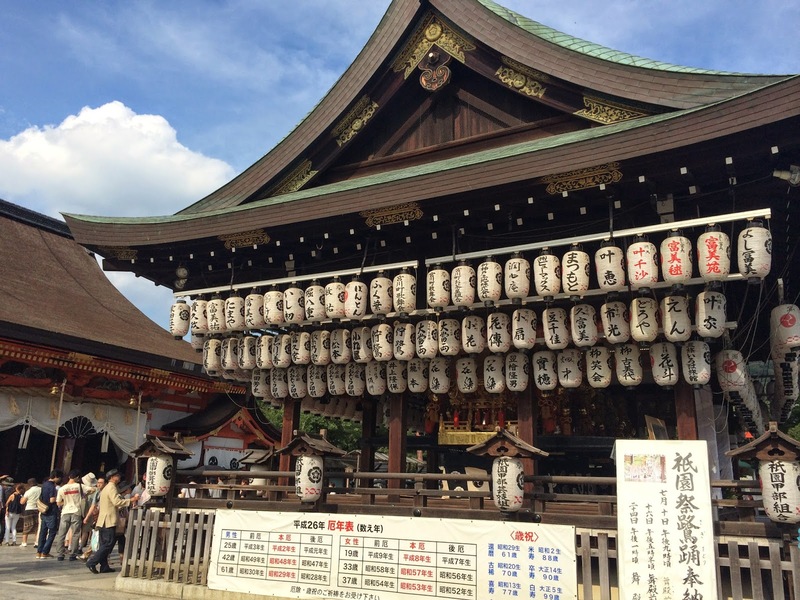 This shrine is very famous for New Year rituals as well as the Gion Matsuri (Gion Festival). 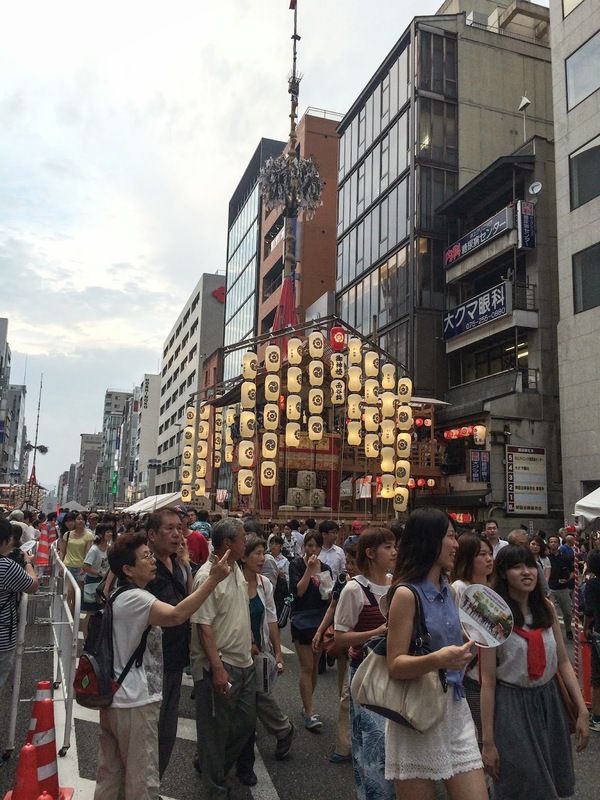 Gion Festival runs from July 17 – July 24, and is one of the top 3 most important festivals in Japan. 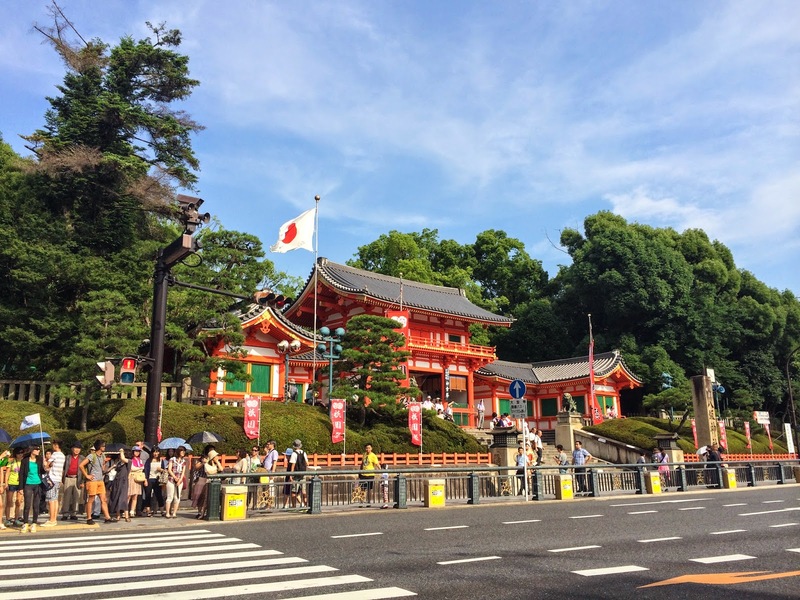 Thousands of people rush on the main street in front of Yasaka Shrine dressed in Yukata (traditional summer Japanese clothing) to see the Yamaboko Floats. There are also a lot of snacks and vendors on the sides of the street. 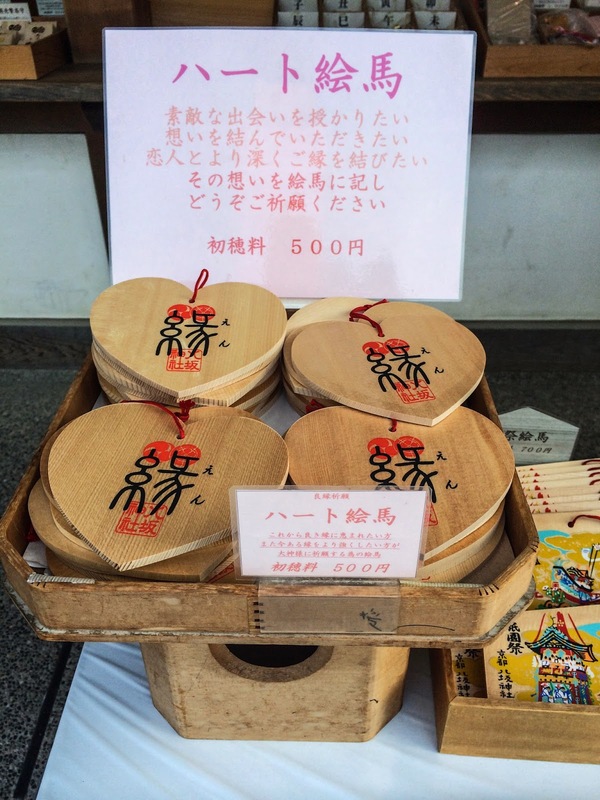 Ema 絵馬, wooden plates for you to write your wishes on and hang at the shrine. This is the first time I've seen Ema that is especially for love! 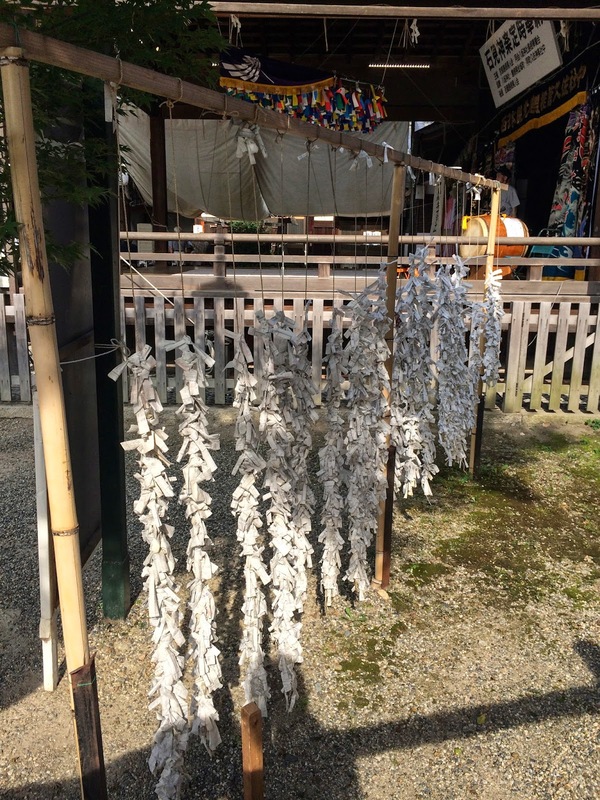 When you draw your luck (Omikuji おみくじ), and you get bad luck 凶, you need to tie your bad luck at the shrine in order to leave your bad luck there. If you bring the piece of paper home, you'll bring the bad luck home with you as well. Luck for safe baby delivery 安産御守. 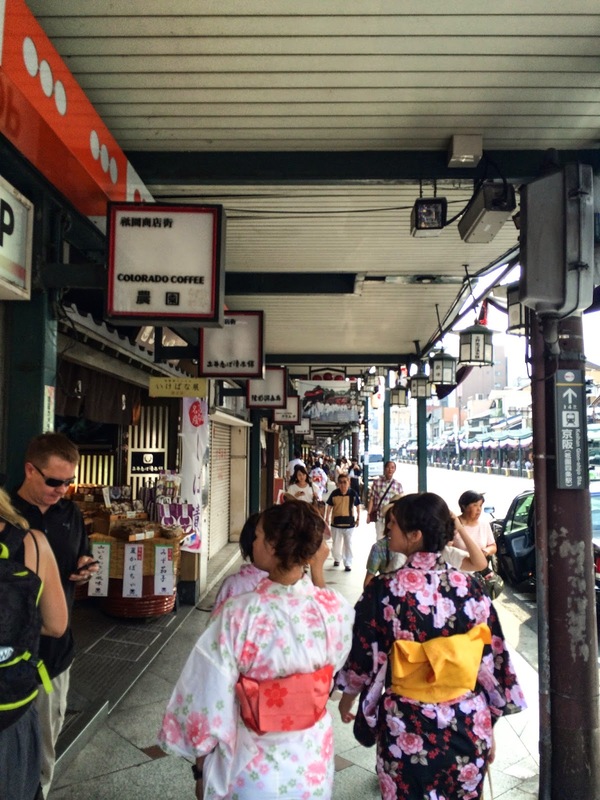 We also wandered to Hanamikoji 花見小路, which is a traditional street where Geishas appear. 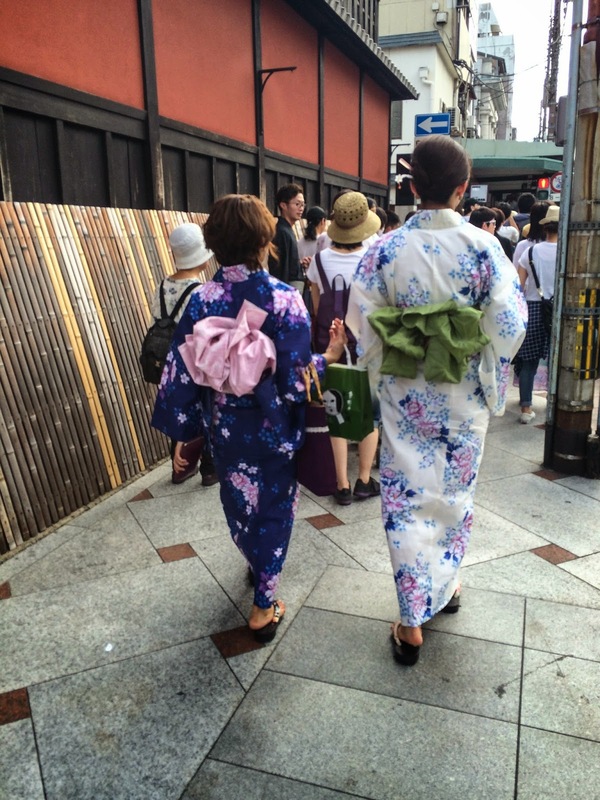 We didn’t see any Geishas but I did manage to catch one riding a taxi. There are also many beautiful areas along the rivers, but you just need to walk around and explore to find them. 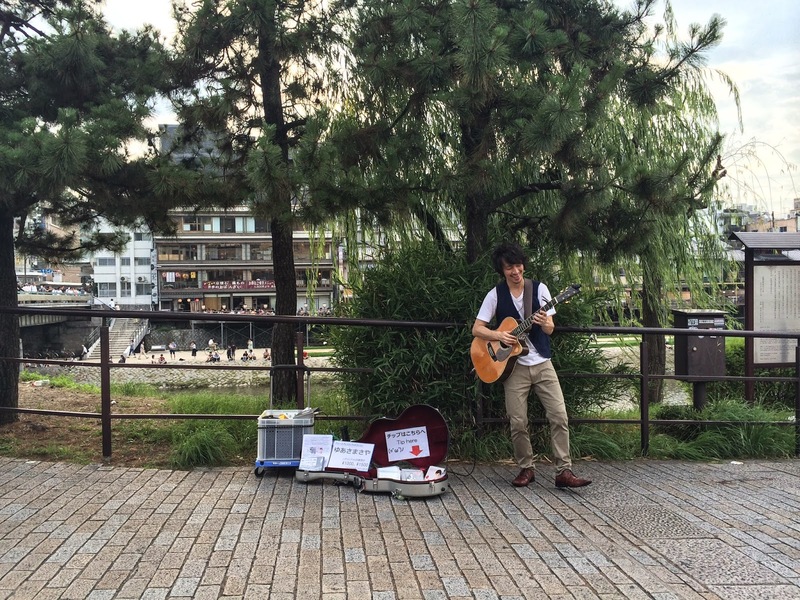 On the way to the main river, there was a street performer playing guitar. He is one of the best guitar players I’ve seen before! I’ve included his performance in my vlog linked at the end. 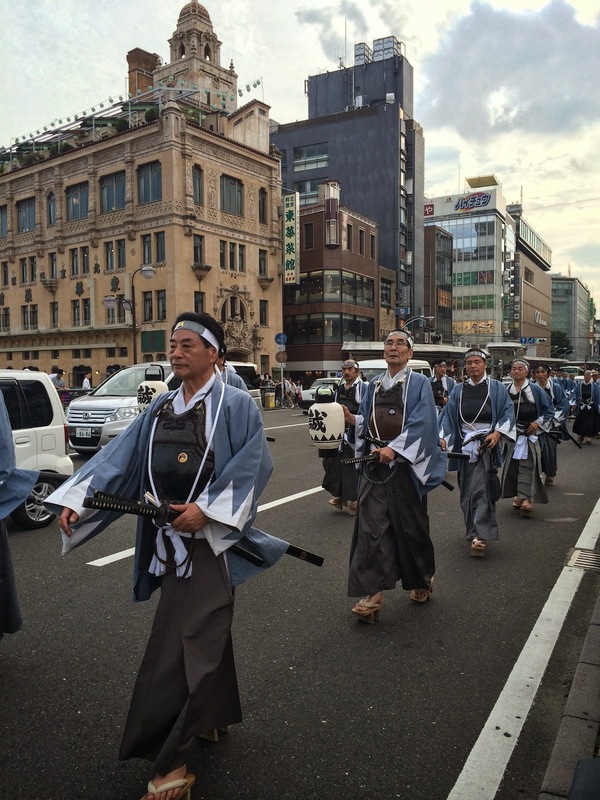 And we also ran into a Ninja Parade. 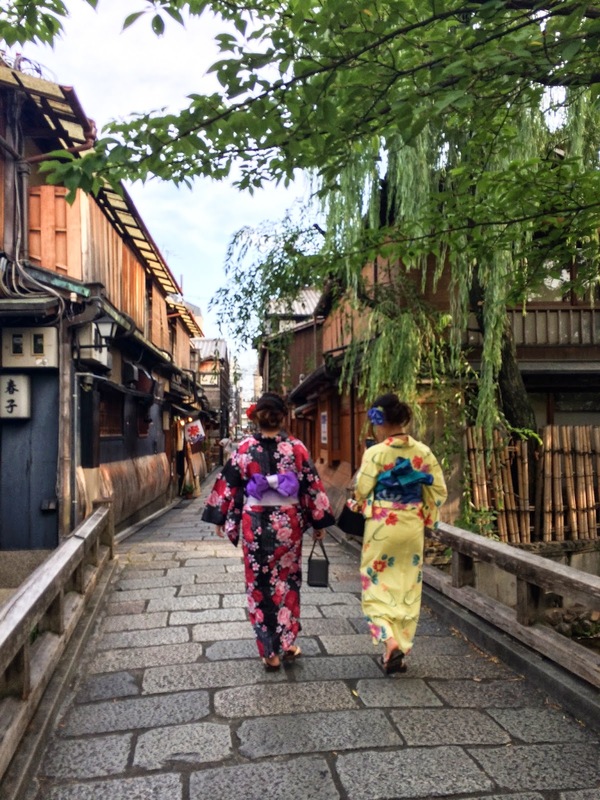 I really wished I was in better health so I could wear my Yukata. I also wore it to a Fireworks show 花火大会 when I went to Tokyo in 2009! This guy is a really really good guitar player. One of the best I've seen in my life! We went back to Osaka area just before sunset since I was still very ill, it’s a pity we couldn’t see Gion Matsuri at night. 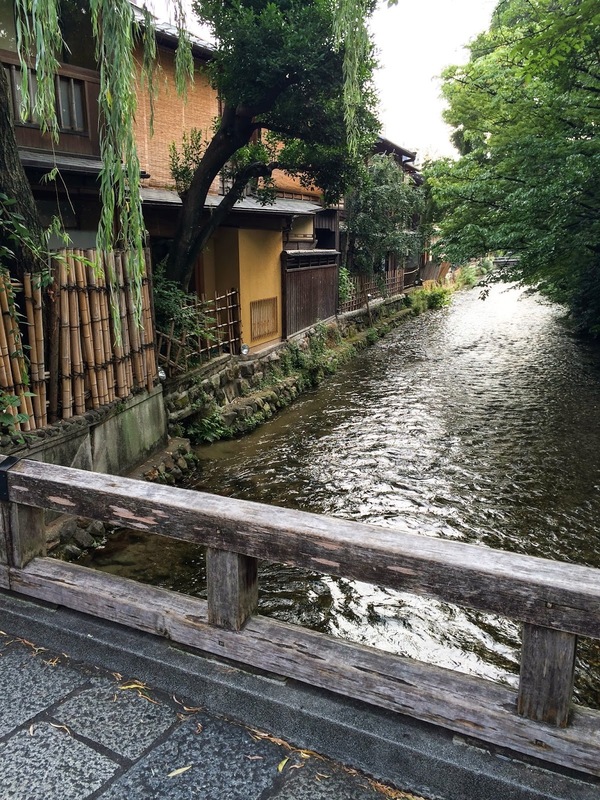 I really appreciate how pretty Kyoto is. 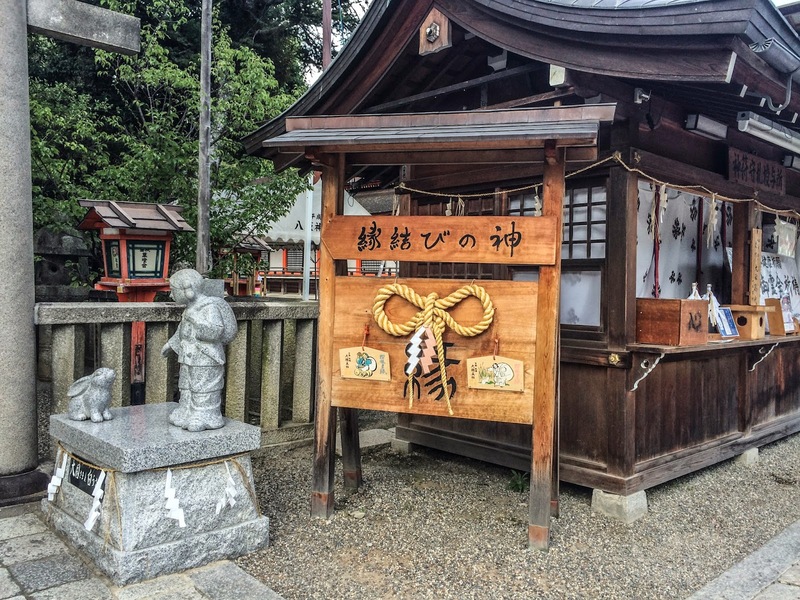 It’s kept just traditional enough and is very very clean despite the amount of tourists visiting the town. 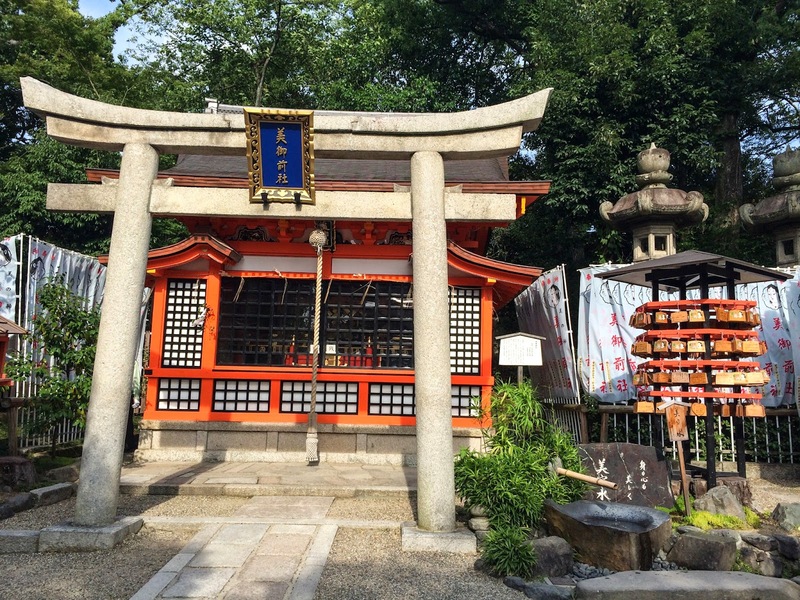 And there are so many different shrines and scenic spots to see. Even though Gion Matsuri was very crowded, but everyone followed the police’s directions and everything was in order and controlled. 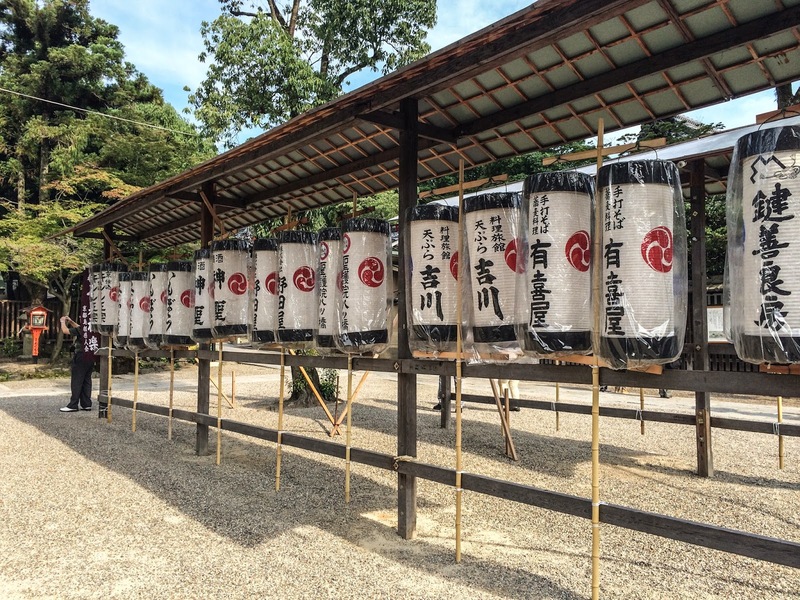 Japan always impresses me in how peaceful and respectful it is. 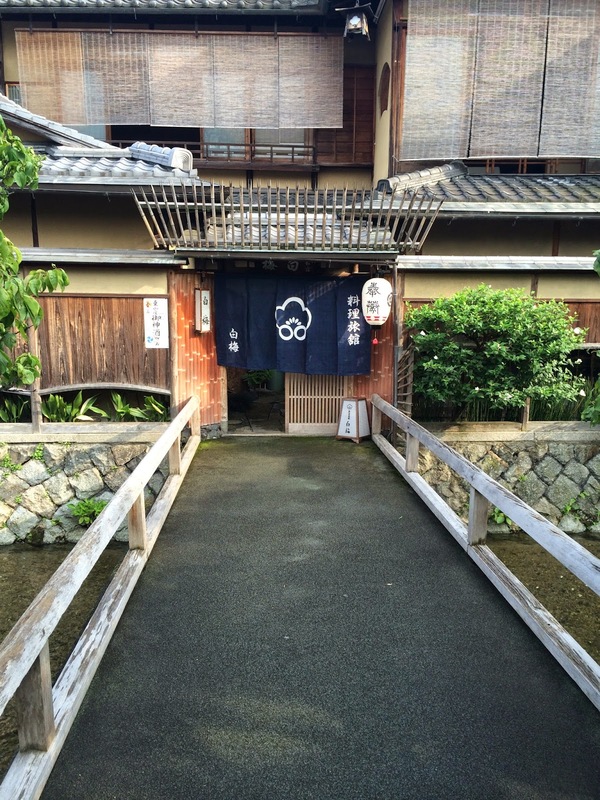 Yamaboko Floats, there are around 20 of them all around the streets of Kyoto. I filmed some of them in my Vlog, which is linked below!